The Steamboat Ski Area has built its reputation on the area’s western ranching heritage and small-town friendliness, along with ski runs through glades of trees deep with powder most of the season. The face of the company since 1970 has been Billy Kidd, who was the first American to win an Olympic medal in skiing in 1964 and went on to a career as World Cup ski racer. Kidd is the company’s director of skiing and runs the Billy Kidd Performance Center. He’s one of a stunning 79 Olympians with Steamboat ties. The ski area is in the Park Range and covers 2,965 acres on six peaks, Mount Werner, Sunshine Peak, Storm Peak, Thunderhead Peak, Christie Peak and Pioneer Ridge, with 1,790 acres of that total in tree terrain. Steamboat boasts an average of 349 inches of snow a year, compared to the 300 inches typical of Colorado’s major resorts, and Steamboat’s snowfall topped 400 inches in three years out of the past decade. The base is at 6,900 feet and the summit at 10,568 feet, for a vertical drop of 3,668 feet. The ski season runs from Thanksgiving to mid-April, with snowmaking capability on 375 acres. There are 18 lifts, including a gondola, with a capacity of 41,465 riders per hour. There are 165 trails, and the ski area rates 44 percent as most difficult, 42 percent as more difficult, and 14 percent as easy. Experts looking for challenges should head to Mount Werner, which has the double-black Chutes 1, 2, and 3 with Steamboat’s steepest pitches, from 62 to 71 percent. Or head to Sunshine Peak and take Shadows and Closet for long, single-diamond runs through the trees with grades around 40 percent. The Sundown and Priest Creek lift lines offer long bump runs, and the Pioneer Ridge is loaded with one-diamond runs. The backside of Mount Warner offers Morningside Park, a bowl with plenty of ungroomed glade skiing, though it’s not as steep as the front side of the mountain. Morningside Park is suitable for intermediate skiers as well as experts. Intermediate runs are scattered around the ski area, but there’s a good group of higher-end runs located off the Pony Express lift in Pioneer Ridge. The green runs are plentiful from the Gondola, Thunderhead Express, and Christie Peak Express. The long Why Not trail is a good choice. Steamboat welcomed snowboarders early on, with its first halfpipe in 1990 and its first terrain park in 1993. Today, it has four terrain parks, one superpipe, and one halfpipe. The Mavericks Superpipe is one of the premier pipes in North America, with an 18-foot-high wall that runs for 500 feet and is 56 feet wide. 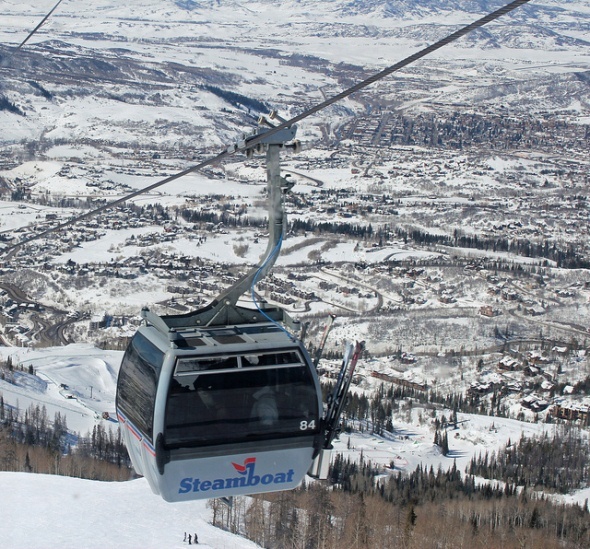 Steamboat has two sets of reasonably priced restaurants on the mountain, at the top of Thunderhead Peak (9,080 feet) and on the Rendezvous Saddle at the top of the South Peak lift.